Transparency Market Research (TMR) notes that the global fiberglass market is categorized by the presence of a few players operating in it. Thus, the market bears a slightly consolidated vendor landscape. The intensity of the competition between the players is likely to increase as they aim at adopting several strategies to offer technologically-advanced products. Out of the various strategies adopted by players in the global fiberglass market to hold a sizeable stakes in the market, capitalizing on the emerging opportunities and focusing on technological expertise for unveiling new products have paid off the most. The global fiberglass market is expected to grow steadily due to the existence of several players who are heavily investing in research and development programs for strengthening their product portfolio and gaining competitive edge. Some of the leading players in the global fiberglass market are Zibo Zhuoyi Fiberglass Material, Taishan Fiberglass, Owens Corning, Chongqing Polycomp International Corp, and Shandong Fiberglass Group Co. Ltd. The TMR report projects the global fiberglass market to register an impressive CAGR of 4.7% from 2017 to 2025. By the end of 2025, the market will be worth US$10.8 bn, predicts the report. Among various application areas, the automotive industry contributed the largest share and is expected to fuel demand in the fiberglass market during the forecast period. This is attributed to increasing utilization of fiberglass products in automotive moldings and rising uptake of fiberglass structures in transportation sectors worldwide. Region wise, North America is expected to account for the leading share in the global fiberglass market in the coming years. This is because the region has seen several end-use industries get established in recent times thus increasing demand for fiberglass for various industrial applications. Fiberglass which is most commonly known as glass-reinforced plastic, spun glass, or glass-fiber reinforced plastic is mainly a plastic material in a resin matrix, containing glass fibers. Such fiberglass exhibit properties such as lightweight, compressive strength, moderate tensile, and easy handling along with outstanding electrical properties. Fiberglass is widely adopted in various industry such as construction, aerospace, automotive, pharmaceutical, and electrical. Such material is considered as a cheapest composite fabric. Rising automotive industry, growing demand for automotive and construction fiberglass products, and increasing use of fiberglass in transit sector are the major factors driving the global fiberglass market. Furthermore, rising use of fiberglass products for providing protection against vehicle crash, growing demand lightweight but mechanically strong products, and increasing fabrication of walls, ladders, and windows are also fueling the growth in the global fiberglass market. Fiber glasses are also extensively used as insulation material worldwide. Such USPs are boosting global fiberglass market. Some of the challenges hindering the growth of the global fiberglass market are high prices of raw materials, absence of control authorities, lack of manufacturers, and health and environment related issues. Nonetheless, increasing demand for fiberglass in making consumer durable products and rising applications of fiberglass in energy conversion solutions are believed to help industry players overcome these challenges in the near future. 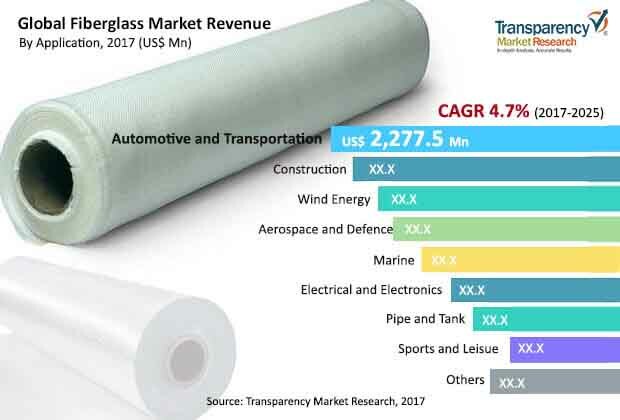 The review is based on a market research report by TMR, titled, “Fiberglass Market (By Glass Type - S-Glass, C-Glass, E-Glass, ECR-Glass, Others; Fiber Type - Rovings, Mats, Strands, Fabrics; Technology - Layup, Resin Infusion Molding, Injection Molding, Compression Molding, Filament Winding, Pultrusion, Others; Application - Automotive & Transportation, Aerospace & Defense, Wind Energy, Construction, Marine, Sports & Leisure, Pipe & Tank, Others; Region - North America, Europe, Asia Pacific, Latin America, and Middle East & Africa) - Global Industry Analysis, Size, Share, Growth, Trends and Forecast 2017 – 2025”.